Signmenu : Digital signage template menu for a quick service restaurant. This template is best showcased on a digital signage menu board and placed at the entrance as well as indoors of the restaurant. 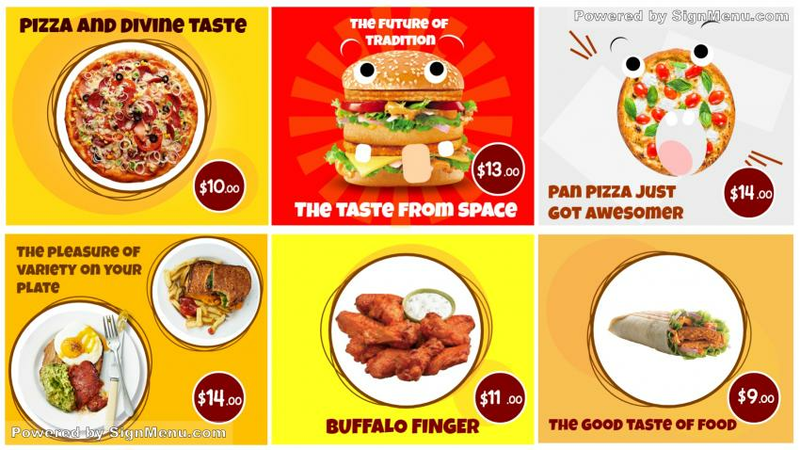 A fast food restaurant with exclusive specials is particularly a busy one, with customers coming in at various times from their offices to have a bite. Also ,flying customers passing by the restaurant from the neighborhood or elsewhere come in with their families. In recent times, digital signage software technology has provided fast food restaurants several benefits which have made their business easier to monitor, as well as be more proactive towards their target audience. This template is ready for download and use.